Its pulp is popularly used to make fruit nectar, smoothies, fruit juice drinks as well as candies, sorbets and ice cream flavorings. 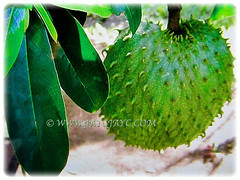 Botanical Name: Annona muricata (syn. 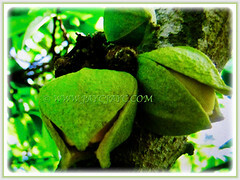 : Annona macrocarpa, Annona cearensis). 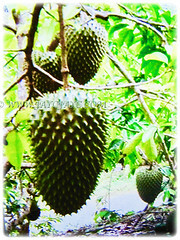 Common Names: Soursop, Prickly Custard Apple, Durian Belanda in Malay. Origin: Native to the West Indies and northern South America. 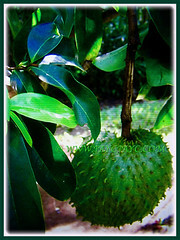 Features: Annona muricata is from the genus Annona that ccomprises of 60 or more species of plants. 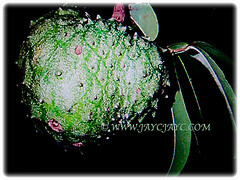 It is a low-branching, bushy, small and upright evergreen tree that can grow up to 4.5 m tall and spread as wide. Moderate-growing tree with young branchlets that are rusty-hairy. The malodorous and alternate leaves, measuring 8-16 cm long and 3-7 cm wide are oblong to elliptical as well as pointed at both ends. They are a glossy dark green and smooth on the upper surface, and lighter green beneath. Flowers are borne singly and may emerge anywhere on the trunk, branches or twigs. 2-5 mm long flower stalks (peduncles) are woody. Pedicels for the individual flowers are stout and woody, minutely hairy to hairless and 15-20 mm with small bractlets nearer to the base which are densely hairy. Solitary flowers emerge on trunk and branches. The flower petals are thick and yellowish. Inner petals are oval-shaped and overlap, roughly 2.5-2.8 cm by 2 cm and are sharply angled and tapering at the base. Outer petals meet at the edges without overlapping and are broadly ovate, 2.8-3.3 cm by 2.1-2.5 cm, tapering to a point with a heart shaped base. They are evenly thick and are covered with long, slender, soft hairs externally and matted finely with soft hairs within. Margins are comparatively thin, with fine matted soft hairs on both sides. The receptacle is conical and hairy. The stamens are 4.5 mm long and narrowly wedge-shaped. The connective-tip terminate abruptly and anther hollows are unequal. Sepals are quite thick and do not overlap. Carpels are linear and basally growing from one base. The ovaries are covered with dense reddish brown hairs, 1-ovuled, style short and stigma truncate. 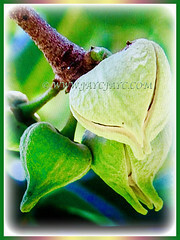 The fruits are dark green, prickly and more or less oval or heart-shaped and sometimes irregular, lopsided or curved. Each moderately firm-textured fruit can be up to 30 cm long and up to 15 cm wide, weighing between 4.5-6.8 kg and consists a core of indigestible black seeds. Their flesh is juicy, acidic, whitish and aromatic. 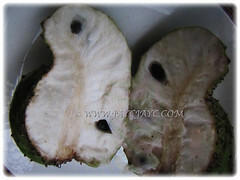 Culture (Care): Annona muricata or Soursop can be grown easily with least maintenance. Soil: Grows best in deep and well-drained soil. Tolerant of poor soils. It’s the most drought-tolerant of all the annonas. Others: Once every fortnightly, fertilise the vine with manure to stimulate growth and fruit production. Generally free from serious pests and diseases. However, watch out for fruit flies, mealybugs and scale insects. 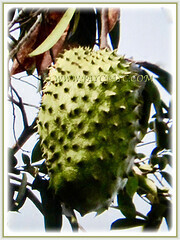 Annona muricata or Soursop is not tolerant of frost. The tree can be killed by only a few degrees of frost and not tolerant of strong winds. 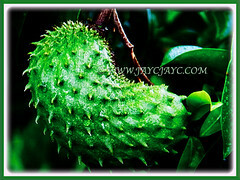 The soursop is adapted to areas of high humidity and relatively warm winters. Temps below 5 °C will cause damage to leaves and small branches and temperatures below 3°C can be fatal. The fruit becomes dry and is no longer good for concentrate. Their white to orange-yellow flowers bloom in late spring. Save the seeds for propagation. 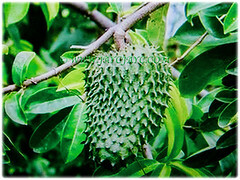 Usage: Annona muricata or Soursop is grown for its 20-30 cm long, prickly and green fruit which can have a mass of up to 6.8 kg, making it probably the second biggest annona after the junglesop. The flesh of the fruit consists of an edible, white pulp, some fiber and a core of indigestible black seeds. The species is the only member of its genus suitable for processing and preservation. The pulp is also used to make fruit nectar, smoothies, fruit juice drinks, as well as candies, sorbets and ice cream flavorings.